TURKISH HISTORY EDUCATION JOURNAL (TUHED) is an international, academic, non-profit, peer reviewed, free access, online journal which aims to enhance theory, research, and practice in history education at all levels through the publication of primary research, review, and translated articles. TUHED committed to no single approach, discipline, methodology or paradigm. Its main concern is to improve effective teaching of history at all level both local and international scale. TUHED recognizes that many disciplines especially history and other social sciences have important contributions to improve history teaching thus invites researchers and writers from them. The journal welcomes both qualitative and quantitative empirical research, theoretical and conceptual analyses, and reviews related to history education, history of history education and historiography. TUHED is published online bi-annually (May and October). TUHED aims to increase the quantity and quality of the studies in this field therefor have adopted the free and open access publication policies. For this purpose, TUHED does not requires submission, evaluation or publication fee for the manuscripts also provides free and unlimited access to published articles. Readers are advised to register the new publication notification service. This can be done by using Journal Register link at the top of the homepage. This will allow the Contents page of new issue to be forwarded to reader via e-mail. This e-mail addresses will not be used for any other purposes, please dfer to the journals safety regulations. 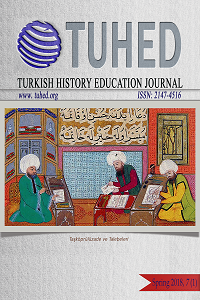 Libraries are advised to include TUHED - Turkish History Education Journal in their open access journals database. For detailed information about open access journal systems please check Public Knowledge Project web page. Within the Budapest Open Access Initiative framework TUHED supports the idea of knowledge sharing for free and without interference. For this purpose, TUHED provides free and unlimited open access to its content.